Mesh emotional support dog vests are an option for handlers who want a lightweight, breathable vest for their animal. These vests offer the same benefits of standard ESA vests but with the added advantage of its light yet sturdy mesh material. 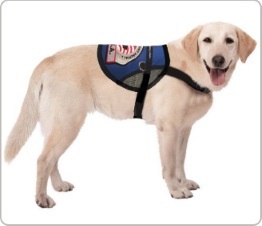 Read on to learn more about the specific features of mesh emotional service dog vests, as well as which breeds of dogs would benefit the best from them. 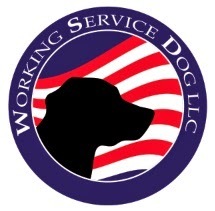 Standard emotional support dog vests are made from padded materials such as high-denier cotton. Although these materials create a strong, weather-resistant vest, a padded vest may not be ideal for all types of dog breeds. Dogs with thick coats such as golden retrievers and collies may get too warm while wearing a fully padded ESA vest. Similarly, standard vests may not be ideal for many types of dogs if they are worn in warmer climates, regardless of the dog's coat length. In either of these instances, a vest made from lighter materials, such as mesh, is needed. ESA mesh vests come with a sewn-on patch that indicates the dog is an emotional support dog. Additional patches that indicate the dog is “in training” or other helpful information for the public may be attached to these vests as well. The vests also come with an adjustable chest and girth strap, as well as a leash attachment. Other optional features include laminated ID badge holder, a reflective strip, and even a zipper pocket for storing belongings. Mesh emotional support dog vests fill the need for a lighter vest option. By providing the animal with a lightweight mesh material, the vest is breathable and more comfortable. Premium mesh vests fit medium, large, and extra large dog breeds up to 41”. A light mesh vest version is also available. This emotional support dog vest resembles a standard cotton vest with padded material on the back. However, this vest has mesh sides to allow for better airflow. This vest supports XXS to XXL dogs up to 42”. Keep in mind that most mesh vests are built to fit medium to large dogs. 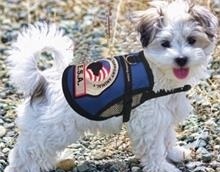 For small dogs, be sure to order small mesh emotional support dog vests, which are specially designed to provide a comfortable fit for smaller ESA dog breeds such as chihuahuas and Pomeranians.